Welcoming the New Year 2017, the first University Choir of Olivet has newly formed at the Riverside campus. The group is now making plans for chapel service and future performance. 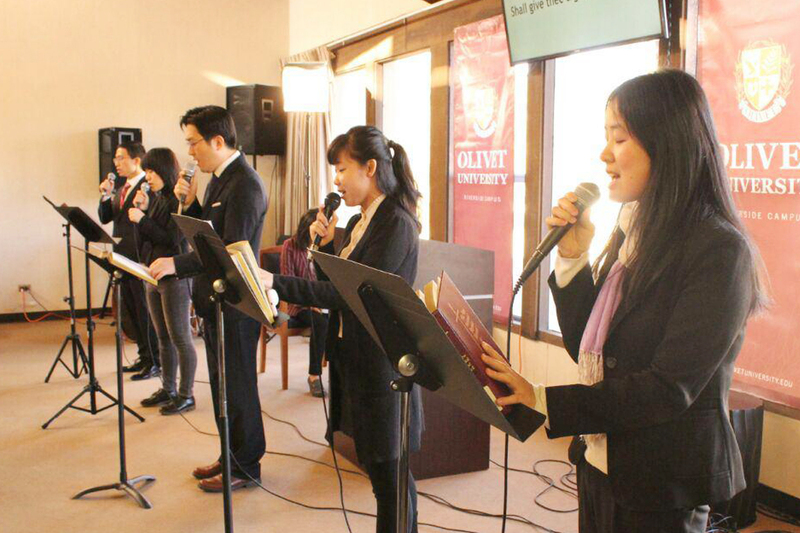 The University Choir provides an opportunity for students of all levels of ability to study and perform worship music. Vocal audition was held on the second week of January to select chorus members with matching pitch and vocal range. Nathanael Lee, a new addition to Olivet University’s Jubilee College of Music at Riverside Campus, will serve as the choir director. Under his leadership, the choir will focus on basic performance skills initially. The main activity will be the weekly chapel service on campus until the new choir fully settles down. “A choir is an important part of worship service, guiding our hearts of praise and leading us to God. We want to share the beauty of sacred music in its traditional and contemporary forms with our students,” Lee explained. While contemporary worship music is a strong emphasis at the Jubilee College of Music, traditional hymns have always retained an importance in chapel services. Now with the start of a choir ministry at Riverside, more elaborated pieces will be incorporated in the worship or simply created for guests on campus to enjoy. The University Choir is also expected to play an important role in creating Christian music and arts culture at Olivet, Lee added.